The September issue of Esquire magazine hit the shelves recently, and while normally this would go unnoticed here, this particular issue has a large food-related feature, subtlety titled, "How To Eat Like A Man Now." 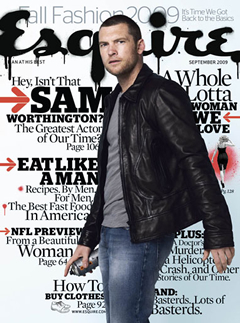 We don't know much about Esquire readers in 2009, and had been under the impression that they were a discerning lot. You know, brand name jeans, a touch of cologne, friends of bartenders, lovers of ladies. We were wrong, and apparently the Esquire readership now skews to the club-totin', "bash your wimmin over the head and drag them to the cave" set. Here we have the ADHD edition of "How To Eat Like A Man Now", in which otherwise sane cooks (Paula Deen notwithstanding) share their beliefs about what it takes to Feed A Man. "How To Forage Like A Man": Wylie Dufresne of New York's wd-50 is given a selection of ingredients and told to come up with a meal suitable for a man. The ingredients are ones that, allegedly, every man has in his fridge: Eggs! Ketchup! Pickles! Boxed mac and cheese! Get past the fact that these are ingredients that most families, single ladies, and old folks have in their fridges, too, and Dufresne comes up with an intriguing take on breakfast for dinner. I mean, I wouldn't want to eat couscous cooked in instant coffee mixed with powdered cheese, but maybe Men do. "The Only Candy A Man Should Eat": Writer Chris Jones seems to understand the humor inherent in Esquire's premise, and fires off a remarkable ode to jujubes. You see, rumor has it that they are made from dead horses, and "by consuming dead horses we're taking their power and virility and making it our own." It's smart, knowing, irreverent: it's what all of this feature should have been had the editor lived in 2009 and not 1975. "How Men Eat": In this (mercifully uncredited) section, we learn truisms like "Hunger spurs creativity in a man", "A beer with lunch can be transformative", and "There is no joy in a wrap." People pay money to subscribe to this? Now excuse me as I read my Cosmo about "How Women Eat." I'm really looking forward to "Hunger spurs thinness in a woman", "Gazpacho is the new Vichyssoise", and "Caution: tonic water has calories." "Why I Like To Cook For Men": In perhaps the most egregious bit of stunt-writing in this piece, Paula Deen is brought in to wax poetic on her love of cooking for the menfolk. Our Lady of Butterfat speaks about how she loved to cook for her teenage sons, and now her husband, because "men make noises." Not like ladies who just sit there and take it, obviously. When Deen claims she "would rather cook for a man than a woman any day," her mid-century Southern mindset shows itself to be just as outmoded and old-fashioned as the tea sandwich. Julia Child didn't make noises over food? You don't think Alice Waters or M.F.K Fisher swooned over a good bouillabaisse? If your lady friends aren't making noises, Paula, maybe it's not them. It's you. I love how Paula Deen degrades her own cooking with her husband's quote: "It doesn't matter to me, as long as I'm full." Discerning palates she favors, eh? I do kind of understand what she's talking about, but I'd change it to "American women" instead of just "women". Dining out with women in the US is a headache and reduces the meal conversation to: "I totally shouldn't eat this, but what the heck" and "I ate like, so badly this week so I can't have that sorry", punctuated by on-the-spot classification of various foodstuffs as "good" or "bad", except not based on their flavor. Ugh. @Anonymous Yes, totaaallly let's just narrow it down to American women, because obviously the more specific your stereotypes are the less of a jackass you are! GREAT INSIGHT! "couscous cooked in instant coffee mixed with powdered cheese"
WHAT?! I thought this was going to be one of those "cook with your coffee maker" situations that doesn't actually include coffee, but no: it is literally what you said. Gross. This post seems so...angry. What did you expect going in? If the magazine in question were called "Maxim," would you be more or less angry about this feature? Little wonder Esquire stopped being relevant, oh, about 15 years ago. anonymous: i think there's a free "esquire" subscription somewhere out there for you. anna: i had to read it twice. it's gross. malcolm: i wasn't trying to be "angry", i was just pointing out that this feature is ridiculous, sexist, and irrelevent to anything worthwhile that's happened in american food in the last, oh, forty years. and if this were in "maxim" or even turned the other way and published in "cosmo" or "redbook"or a similar women's magazine i would think it was just as pointless and backward thinking as it is in "esquire". Oh, good Lord! This takes me back at least 25 years to a priceless little gem called "Real Men Don't Eat Quiche," which claimed that the fruit and vegtable category for real men consisted of orange soda, peas, and french fries. It's a lttle depressing that of all the stereotypes Esquire could have chosen to reinforce, they picked the Meathead Male. Where is the ever-smooth, ultra-sophisticated, Don Draper when you really need him? @tushfestival & Stephanie: Ignoring the immature portion of your responses--but seriously, you guys have never had to eat with the diet-obsessed women here? It's not fun. Maybe it's because I live in an area where it's bikini-season all year round, but it's night and day difference from dining in Europe. Or Asia and the Middle East for that matter. Or maybe diet-talkers make up a large part of the audience on this site. I hope not. Either way, I didn't intend to offend, and I didn't realize we were taking the Esquire articles so seriously. /They/ certainly don't take themselves seriously. It might help if you considered all the diet talk as a kind of ritualized beginning to the dinner conversation. We don't like to jump right into more meaty topics such as politics, the arts, or sports, and we have to start off with something, and since the food is right in front of us...well, you get the picture. But really, after we (and I mean men as well as women) have hit all the traditional marks, the conversation does rapidly move on. And after you get trapped in a couple of dinners where the conversation deteriotes into The Long Pointless Argument (usually regarding politics, the arts, or sports), then you, too, will be grateful to go back to a little harmless food talk. Trust me - innocous dinner table conversation can be your friend.